Stockpiling massive amounts of surplus items in one’s home can be seen in either of two ways: One, you’re unmotivated to give the home a solid sweep through and cleaning; or two, a hoarding disorder is starting to rear its ugly head. In the first instance, tapping into the drive to clean up is all it takes to avoid a cluttered home environment. The second instance (when a hoarding disorder emerges) paints a far more drastic picture, one that can be compassionately addressed by family, friends, a therapist and medication. Hoarding rarely occurs overnight. 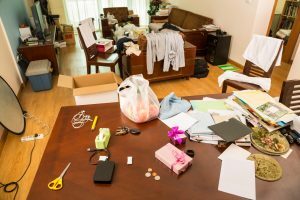 People with a hoarding disorder, over the course of decades, gather items and store them infinitely in their home—or until a concerned family member or neighbor takes notice of the chaos. The Diagnostic and Statistical Manual of Mental Disorders, published by the American Psychiatric Association, classifies hoarding disorder as a mental illness. Symptoms of hoarding are similar to obsessive-compulsive disorder symptoms. Those experiencing hoarding tendencies can be helped. The following strategies are designed to support those whose hoarding activities are in the early stages. People who hoard do so out of compulsion. Separating from collections of old receipts, newspapers or clothes, for example, can unleash a tidal wave of anxiety in the person who hoards. The mere thought of letting go of any possessions is emotionally unbearable. Cognitive behavioral therapy battles the deeper, unexplored motivations that spur hoarding practices. A licensed therapist will work with the individual displaying hoarding behaviors for several months or even years. Therapeutic intervention addresses the thought patterns of and belief systems in the hoarder. A psychotherapist helps the hoarder learn to resist the impulse to obtain additional items. Therapy opens the door to improved social outlets, so that the hoarder in the beginning stages of the disorder no longer feels isolated. Antidepressants are prescribed by mental health professionals when a hoarding disorder starts to emerge. Pharmaceuticals, like SSRIs (selective serotonin re-uptake inhibitors), are beneficial to the impulse collector, as such medications are also found to help those suffering from obsessive compulsive disorder. Aside from therapy and medications, an extreme saver can start with daily, practical solutions. When shopping, ask yourself if you can really use the item that attracted your attention. You may realize two to three items identical to the one in question on the store shelf already have a place in your home—and they’re in disuse. When you realize you don’t need the product at the store, don’t buy it. Some people shop because they are bored. Others feel less lonely when a surplus of toys, boxes of ornaments or even canned food surround them in their bedroom, living room or kitchen. Make efforts to discover what stimulates your decisions to buy, buy, buy. When you uncover what lies underneath the hoarding impulses, you can take steps to resolve them with a trusted friend or therapist. Hoarded items can be gifts from family or friends. Collected junk can also be the unwanted refuse friends or family members have asked you to store for them. The simplest strategy to unburden your home of junk is to say no. Respond assertively to neighbors or family members who ask you to keep some of their possessions. If you have a hard time saying no, your home environment can start to take on a life of its own. Hoarding activities also result from making impulse purchases. Record how much money you’ve spent on unnecessary junk. Crunching the numbers is likely to leave you stunned. The shock value of the amount of money spent on goods in your home may be just the right antidote to prevent further spending on needless things. A trusted friend can go a long way in helping when you have a knack for keeping pointless things. Choose a friend who easily tosses useless junk. The candid opinions of such a confidante can help you purge your closet, garage, kitchen or bathroom of unusable goods. One of the most promising tactics to thwart hoarding tendencies is to organize your home. In the garage, for instance, place similar items together in bins or on shelves and label them. You’ll know where your possessions are, and you’ll experience less of a struggle when attempting to find them. A beneficial consequence of knowing where your tools are is not buying more of them. Just as hoarding activities start slowly, eradicating your home of surplus knickknacks involves a gradual effort. Make a goal to unclutter one room per weekend. Clean up the bathroom, for instance, safely discarding old medications; toss old food from the kitchen; and, donate old clothing from the bedroom closets. Over the course of a few months, your home will be organized and uncluttered. You can breathe easy, knowing you are well on your way toward discontinuing a hoarding pattern. When you or someone you know is experiencing the ill effects of a hoarding disorder, you may require professional hoarding cleanup. ServiceMaster Disaster Restoration and Recovery provides hoarding and estate cleaning services with a reputation for excellence and sensitivity. 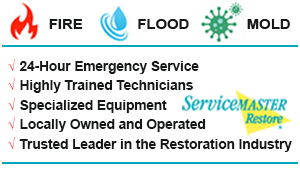 Skilled cleaning specialists from ServiceMaster Disaster Restoration and Recovery build a trusted relationship with the customers they serve. Our technicians consult with the individual with the hoarding disorder during every step of the cleaning process. Nothing is discarded without the customer’s involvement. Our specialists also help organize the home, distribute items of value to family or friends, donate usable items and provide assistance with paperwork as it pertains to lawyers or government officials. Once the cleanup is complete, the technicians follow up by phone, offering subsequent cleanings, if necessary. 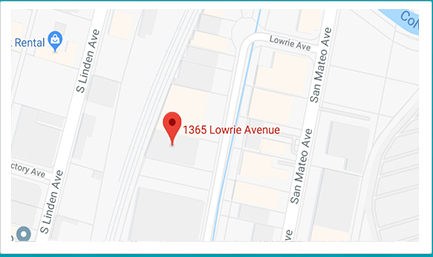 The community of San Mateo, California, relies on the hoarding cleanup expertise and thoroughness of ServiceMaster Disaster Restoration and Recovery. Hoarding cleaning services are available for any level of hoarding.